The Kansas Jayhawks take on the Iowa State Cyclones on Saturday at Jack Trice Stadium. The opening line for this game has Iowa State as 14.5 point favorites and the over/under was set at 57. Kansas was led in passing last game by Montell Cozart, who finished with 193 yards through the air. He went 13 for 18 on the game, good for a 72% completion percentage. The Jayhawks were led in rushing by De'Andre Mann, who finished with 40 yards on 5 rushes. He ended the contest with an average of 8 yards per carry. Tyler Patrick led the team in receiving with 3 receptions for 70 yards. He had an average of 23 yards per reception in the contest. As a team in that game Kansas got a total of 18 first downs by way of 1 rushing, 15 passing, and 2 by penalty. They ran 61 total plays for 342 yards for the game. The Jayhawks ran for 64 yards on 29 attempts. Iowa State was led in passing last game by Sam Richardson, who finished with 269 yards through the air. He went 25 for 42 on the game, good for a 60% completion percentage. 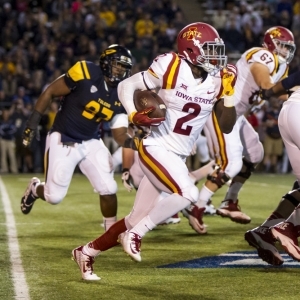 The Cyclones were led in rushing by Mike Warren, who finished with 126 yards on 21 rushes. He ended the contest with an average of 6 yards per carry. D'vario Montgomery led the team in receiving with 4 receptions for 97 yards. He had an average of 24 yards per reception in the contest. Iowa State got a total of 27 first downs by way of 13 rushing, 13 passing, and 1 by penalty. They ran 92 total plays for 481 yards for the game. The Cyclones ran for 207 yards on 49 attempts. Kansas is scoring 25 points per game on offense this season. In the passing department, they are averaging 20.7 passes on 36.7 attempts for a 56.4 percent completion percentage this season. They throw for a total of 244.7 yards per game through the air as well. The Jayhawks carry the ball for an average of 181 yards per game on 42 attempts for an average of 4.3 yards per carry this season. They also run 78.7 plays per contest and average 5.4 yards per play for an average of 425.7 yards per game. The Jayhawks are averaging 23.3 first downs per game and they accumulate 63 penalty yards per game via 6 penalties. Kansas gives up an average of 288 passing yards and 41 points per game on the defensive side of the ball. They allow 19.7 completions per game on 28.3 attempts for a completion percentage of 69.4. The Jayhawks allow 254.3 rushing yards per game on 49.7 carries for a 5.1 average per play. Kansas allows 542.3 total yards per game including 7 yards per play. They force 2 turnovers per contest and get flagged for 6.7 penalties for 54.3 yards per game. Iowa State averages 23.7 points per game this season on offense. In the passing department, they complete 22 passes per game on 35.7 attempts for a 61.7 percent completion percentage. They are throwing for 251.3 yards through the air per game thus far. The Cyclones carry the ball for an average of 115.7 yards per game on 36 attempts for an average of 3.2 yards per carry. They also run 71.7 plays per game and average 5.1 yards per play for a total of 367 yards per game. The Cyclones get an average of 20 first downs per game and they average 68.7 penalty yards per game via 7.7 penalties. Iowa State gives up 176.3 passing yards per outing and 22.7 points per game on the defensive side of the ball. They allow an average of 15.3 completions on 29 attempts per game for a completion percentage of 52.9. The Cyclones allow 185.7 rushing yards per contest on 40 carries for a 4.6 average per rush. Iowa State allows 362 total yards per game for an average of 5.2 yards per play. They force 1.3 turnovers per contest and 8 penalties for 60.3 yards in each contest.